The misinterpretation of IBC model building codes and NFPA 80 and 101 guidelines regarding where fire resistive-rated glazing versus fire protective-rated glazing must be used can be costly. The underlying concern pertains to the protection against the transmission of radiant heat. Fire-resistive glass and frame assemblies provide a radiant heat barrier that ensures the safe evacuation of the building, protects fire-fighters while they do their job, and reduces losses suffered by building owners. Since the codes can lead to confusion which often results in the use of insufficiently safe framing assemblies, a proposed NFPA 80 annex note that clarifies situations where fire-resistive framing must be used recently passed the first NFPA 80 Technical Committee ballot. This article explains why NFPA 80 considers annex note to clear up framing confusion, especially in applications where fire resistive framing must be used instead of hollow metal. Simply put, the annex note seeks to underscore that the entire assembly must fully meet the requirements of the code. When codes require fire resistive glazing, the entire framing assembly must meet the same fire resistive requirement. Combining non-fire resistive framing products, such as standard hollow metal framing, with fire-resistive glazing downgrades the entire assembly, resulting in an insufficiently safe assembly and a failure to meet the true intent of the building code. Examples abound where the authority having jurisdiction (AHJ) has ordered the removal of non-compliant assemblies. Here are some examples where fire-resistive assemblies are required, and framing systems such as hollow metal tested in accordance with NFPA 252 and NFPA 257 test standards are not allowed. Sidelites/transom frames in 60- minute or 90-minute fire door assemblies.Where NFPA 101 and IBC 2012 require the use of 60-minute or 90-minute fire doors, hollow metal sidelite/transom frames tested only to NFPA 252 are not permitted. In a door assembly required to be rated 60 or 90 minutes, while the door and door frame may be rated 60 or 90 minutes in accordance with NFPA 252, the sidelite/transom portion of the assembly should also be tested to ASTM E-119 or UL 263. NFPA 101 and IBC 2012 require sidelites/transom portions of the assembly to be rated equal to the wall. Click here to download the NFPA 101 fire rated glazing assemblies tables. Click here for the IBC 2012 fire rated glazing assemblies tables. Sidelites/transom frames in 1 and 2 hour stairwells enclosures in sprinklered buildings. While 60-90 minute temperature rise doors in 1 and 2 hour stairwells in fully sprinklered buildings may not have to meet temperature rise requirements under the IBC model building code, the sidelite/transom frames and glazing must be a fire resistive assembly (i.e., must meet ASTM E-119.) Fire-protective framing systems tested up to 90 minutes are not allowed. Assemblies that exceed 25% of the wall. 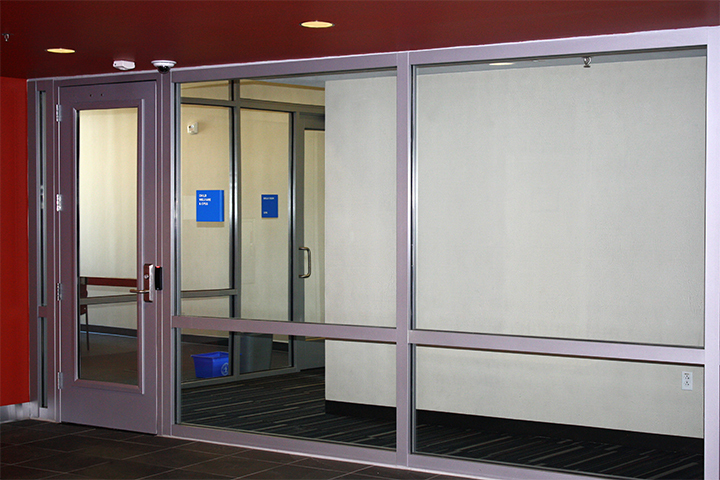 When sidelites/transom frames exceed 25% of a wall adjoining a partitioned space, the assemblies must meet ASTM E-119 testing requirements and must be rated equal to the wall in which they are installed. Again, framing systems such as standard hollow metal cannot be used. In this example, standard hollow metal frames, although listed up to 90 minutes or higher, cannot be used because they typically do not limit the temperature rise of the non-exposed frame surface as required by ASTM E-119. The glazing used in this 1-hour exit corridor exceeds 25% of the wall area. So, 60-minute fire resistive glazing and framing tested to ASTM E-119 was used in the assembly adjacent to the door. In November 2013, Kate Steel, a nationally recognized code consultant and NFPA 80 task group member, presented examples of improper installations of fire-rated products that were later ordered removed. These examples helped persuade the NFPA 80 Technical Committee to finalize language of a proposed annex note. “This is a positive contribution by the NFPA 80 Technical Committee to explain requirements that are often misunderstood by both design professionals and code officials,” said Steel. “I spend considerable time answering framing requirement questions unfortunately, sometimes after an improper installation has taken place. We really need to clear up confusion about framing. The proposed annex will help code users better understand the complexities of the code provisions.” Hopefully Kate’s advocacy, and that of members on the NFPA 80 Technical Committee, for the utmost fire protection whenever and wherever possible will lead to a clearer understanding on the part of specifiers, designers, and contractors regarding the safe use of fire-rated glazing systems.